US airlines collected $4.6 billion in checked baggage fees in 2017. That’s an impressive sum of money to have collected for something that was basically free a decade ago. But is it all good news for airlines? Maybe not. Since 2008, airlines have continuously increased various checked baggage fees. Recently, most major US airlines announced that checking two bags will add $140 round trip on most fares. JetBlue’s CEO defended these recent Checked Baggage Fees hikes as a way to innovate the rest of their business model. While this may be true, it is also a blatant admission that the airlines fail to see baggage fees as anything more than a means to an end. They plan to enhance the experience for their loyal customers, but not the baggage experience. Instead, baggage fees are going to fund innovations elsewhere while checking baggage is not improved. Essentially, airlines are growing baggage revenue by raising prices without any real innovation or added value. Given the parallels to the taxi industry circa 2013, let’s examine whether the conditions are present for airline checked baggage fees to be disrupted by a better, more efficient way of transporting bags from point to point. Much like the taxi industry, the process of checking bags has not changed a whole lot in many decades. It remains inefficient, cumbersome and not entirely reliable. The only real innovation has been that airlines forced passengers to do more of the work by pushing the use of self-service check-in kiosks. And baggage claim? Well, let’s just say that it hasn’t improved much either. Just as the taxi business was slow to make changes with the proliferation of the on-demand and gig economy, airlines lack of innovation in the baggage handling area may be setting themselves up for the same potential fate and outcome: their customers will begin to look for new alternatives. As the price of checking bags continues to increase without any meaningful improvement in process, the value is diminishing. In some cases the cost to check baggage can cost more than the airline ticket itself! 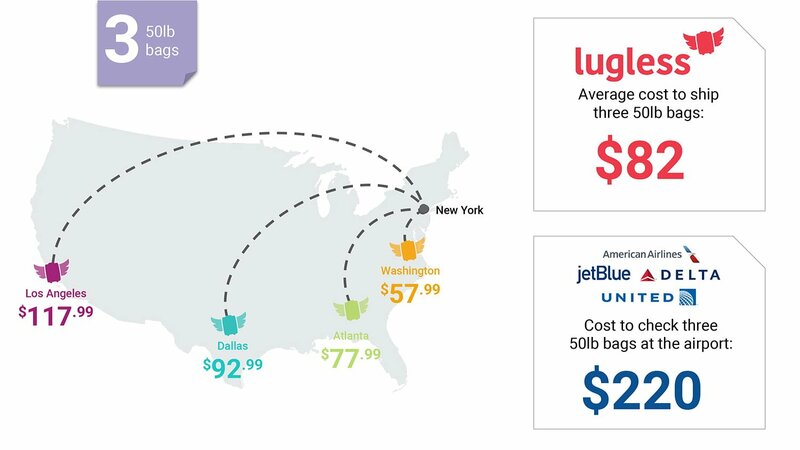 What’s more, the pricing structure for most major airlines is static, so that people traveling a short distance, say Boston to Philadelphia, pay the same price to check a bag as someone flying from Boston to Seattle. Spirit Airlines, a pioneer of sorts in the ancillary revenue department, has in fact begun experimenting with a dynamic checked baggage fee model, but other airlines have not followed their lead. 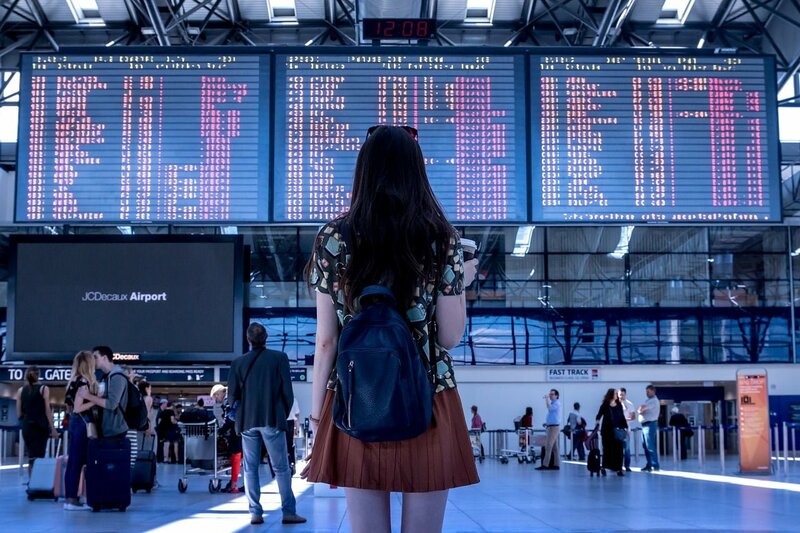 As travel booking sites like Kayak, Expedia and Google Flights have integrated a baggage fee calculator into their platforms, there will be incentive for airlines to compete on price for these fees, but we’ve not seen this take hold yet. You can’t buy a ticket on Spirit and check your bags on Delta because it’s cheaper, even if the planes are going to the same airport. Now, there are obviously some very good security rationale behind this, but nonetheless, once you buy your flight there is no competition for transporting your baggage. The bottom line is that customers, airline passengers included, will always demand convenience, value, and choice. And when that demand grows large enough, the market will deliver. Just ask taxis. Will things change in 2019? As we all have a laugh at whether the canned tuna industry is on its last legs because millennials don’t own can openers, the changing demographics of travelers could actually have a real, bottom line impact on the billions of dollars of checked baggage fees collected by airlines each year. The fact is that millennials are the fastest growing consumer segment for travel, and they have shown no mercy in decimating legacy industries and processes. Once an alternative to checking bags exists that is cheaper, easier and in touch with current traveler’s wants and needs, we will almost certainly see checked bags, and the revenue that they generate, begin to decline. In recent years, a growing number companies have been eager to address this opportunity by offering to ship flyers luggage in order to avoid the inefficient, outdated, and broken process of checking bags. The theory goes: In the same way that Amazon leverages UPS and FedEx to bring the shopping experience to your front door, these services leverage these carriers to let travelers avoid the hassles of checking luggage. The concept is great, but the reality is that most of these services come with an eye-watering price tag (think: $80 – $200+ per bag, one way). Nonetheless, these companies are winning over some travelers who are willing to pay a premium for a better experience. Are airline CEOs losing sleep? Probably not yet, but they would be wise to pay some attention to how their customers are speaking with their wallets. Most luggage shipping companies are private, so reliable data is hard to come by, but indications are that they may be starting to get some traction, particularly in light of recent increases in checked baggage fees. As we saw with the Lyft/Uber example, the tipping point for luggage will come when an easier, more reliable option is available at a price that is comparable to the existing behavior – checking bags. While the conditions are present for disruption of the checked baggage model, nobody has quite cracked the code until, perhaps, now. 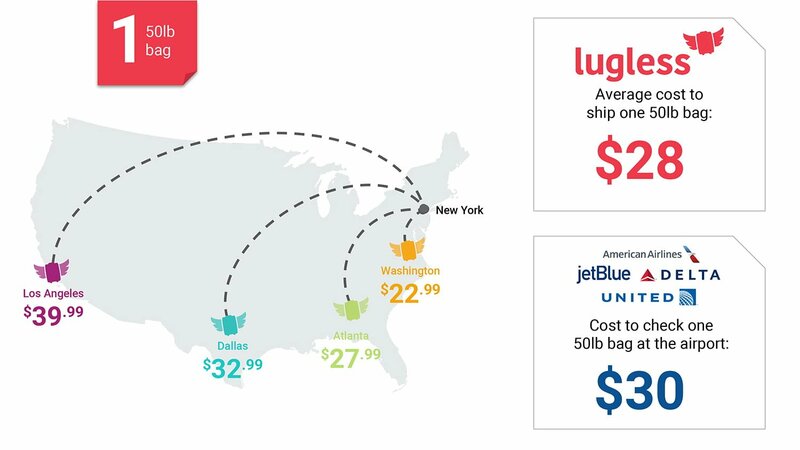 In late 2018, the first luggage shipping solution was introducer that is actually cost-competitive alternative to checking bags. Like other services, the model leverages existing logistics networks but what makes them disruptive is that they use a proprietary shipping search engine that finds and compares the absolute lowest UPS and FedEx rates to generate the cheapest shipping label for any travel itinerary. This approach allows travelers to ship luggage directly to their destination for as little as $15. If a shipping label is all you need, there is no other cost to using the platform. If you need a little more help with your shipment, you can add extra features, like additional insurance coverage or a doorstep pickup, for an additional fee. Will an easier process and cheaper rates be transformative enough to shift how millions of travelers get luggage to their destination? It’s too early to tell, but 2019 is probably the year that we’ll get some answers.